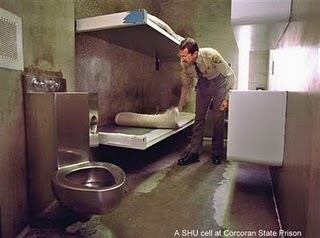 Like all oppressed people, prisoners confined to these torture units must not only contend with seeking ways to resist the unrelenting, daily assaults on their psyche and humanity, but must also contend with the prospect of people who have never been subjected to the inexorable psychological and physical degradation of being confined to a bathroom with 2 bunks crammed into it for 23-24 hours a day, every day, trying to define ourreality. It has recently been suggested that those confined to these sensory deprivation torture units indefinitely, but who have a cellie, are not in “solitary confinement,” as though another human occupying a space not even large enough for one will somehow mitigate the deleterious effects of this isolation. It doesn’t. The only marked difference is the number of stressors you must contend with in a day. Having a cellmate under this circumstance forces you to modify your daily life to account for the mood swings, biological activities, and other idiosyncrasies of someone who is always– no matter how far in this tiny cell you go – only 2 steps away from you. California’s CDCR’s Security Threat Group Pilot Program (which includes its proposed step down program [S.D.P.] ) is a document intentionally designed to fail. It not only grossly deviates from the behavior-based intent the department swore to the public, legislators, and prisoners subjected to these torture units for the past 10, 20, 30, or 40 years – but actually codifies an expectation of all prisoners to become state informants in the service of maintaining these torture units in violation of already established law. This is an intentional lie. By CDCR’s own admission, one of the primary reasons they have maintained these torture units and created ‘sensitive needs yards’ is that such informing will incur violent retaliation against suspected informants. Their inclusion of this provision has a more insidious purpose related to their Schenerian behavior modification program, but for purposes of this discussion we’ll stick to the 8th Amendment violation inherent in this action by the state. The court accordingly found this compulsory requirement to inform violates the 8thAmendment of the U.S. Constitution, yet here we see CDCR not only expanding it outside the confines of the debriefing process, but codifying it as an expectation for inclusion in the S.D.P., something no principled man or woman currently consigned to these torture units will submit to under anycircumstance, and CDCR is fully aware of this fact. They are fully aware that it ciolates established law. They are fully aware that it violates the U.N. Treaty against Torture and other cruel and degrading treatment… They just don’t care. They are counting on the disinterest and political apathy of you– the people – to turn a blind eye to their maintenance if these torture units in your name, with your tax dollars. The only question facing us as a society is: will you? Only you can answer that question.